I will of course reimburse you for cost and time if it comes to that! Measuring mine in current use, I found that a button for a looser pull measures .180-.190”, tighter pull around .200- .210” and super tight around .215” (on the verge of snapping the button off). Most of mine mic in at .190 & .210”- I keep a “loose” & “tight” one for each kit- Range bag, home shop, bug out bag. 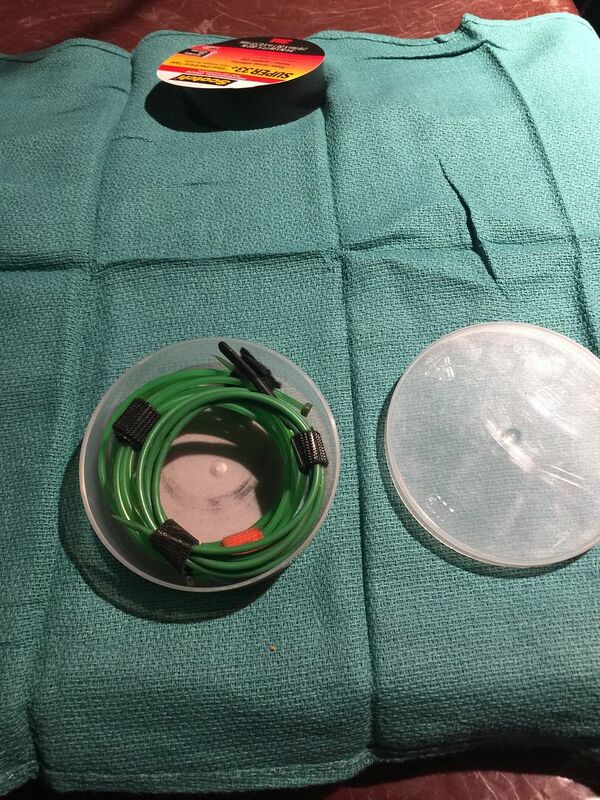 I keep mine sorted by wrapping them with different color Velcro strips and often blacken the end of the button of the tighter/.210” ones with a Sharpie so I have a quick visual reference which helps because I always use a jag puller, a .205” followed by a .210” in that order. Before storing them back in the safe, I usually pull a wet jag puller to oil the bore and prevent rust- if you do this, ALWAYS remember to pull a dry patch before shooting. 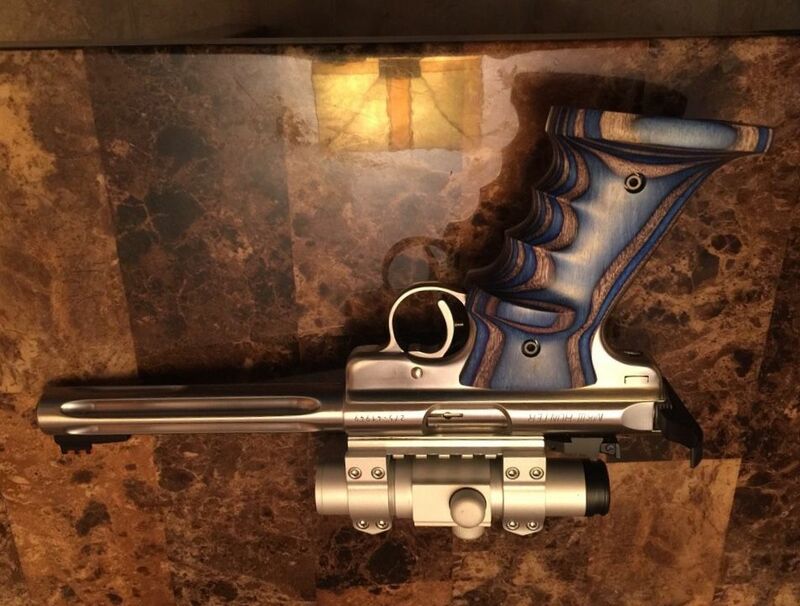 A couple drops of lube in a bore can be invisible, until hydraulic force from a live round bulges your barrel. I know this to be true because I’ve seen it happen to a friend, right in front of me. Good news is it was a stock barrel that we planned on upgrading anyway but it was a valuable lesson learned. 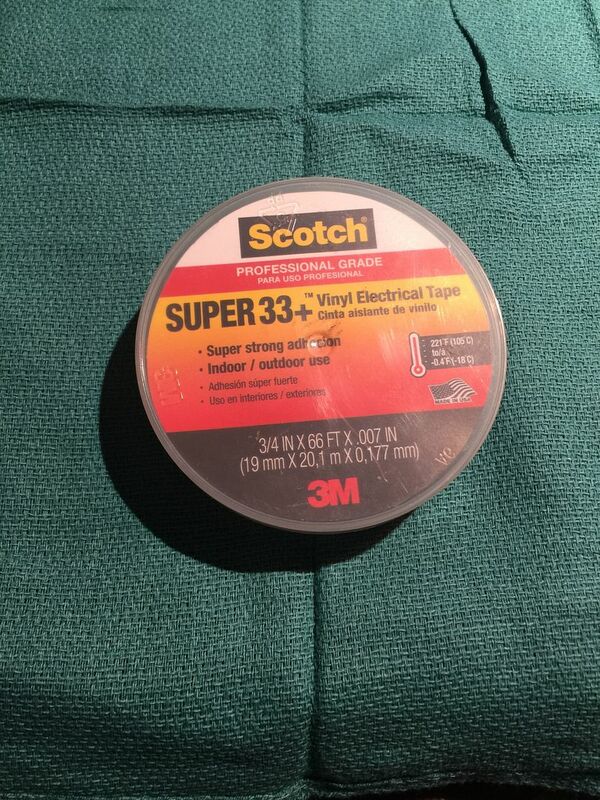 Also- 3M brand “Super 33” Electrical Tape comes in small round plastic containers that are PERFECT for storing and toting jag and patch pullers in your range bag, see pic below. You’ll find that a .210” will produce an audible squawk sound on pull through. The thickness of the patch cloth and viscosity as well as amount of schmoo on the patch makes a difference. I usually pull a jag soaked patch 2-3 times (fresh patch each pass) followed by a thoroughly soaked .205”. That gets out most of the schmutz. Then I pull a few wet .210s... a few drops on the patch and pinch off excess before pulling. Then dry patches til clean. If I’m still getting carbon, I go back to a wet .210 or brush puller once or twice. Beware extractor grooves as they can score the line. Always center the button & pull straight to avoid sawing against the crown. Last edited by DrGunner; 08-12-2018 at 11:27 PM. I probably should have taken the time to document and photograph this earlier... this thread seems to be an ever-evolving entity. So, I decided to keep updating it and adding to it as member input and new materials and techniques come to mind or are developed interacting with all of you. 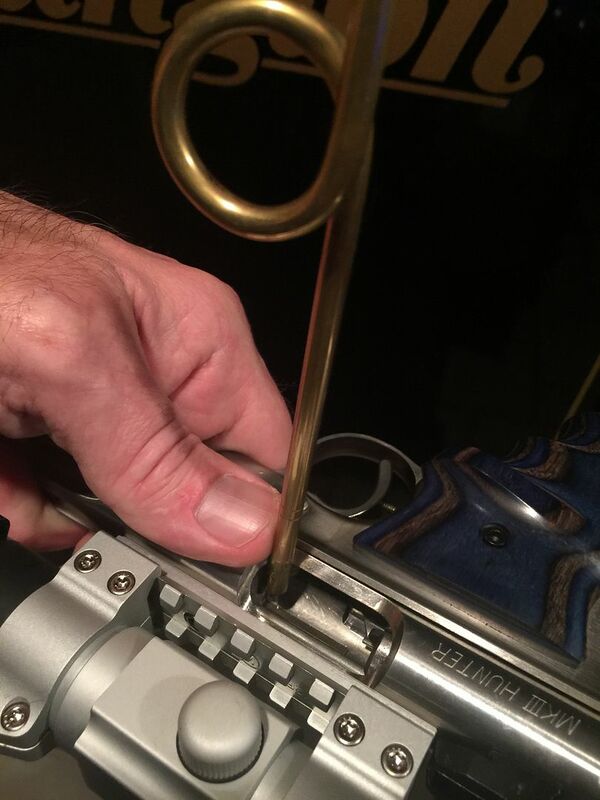 There’s a trick to using my finger loop chamber brush that involves a specific way of holding the gun being cleaned in such a way as to position your thumb to serve as a backstop to the shaft of the chamber brush which provides leverage to facilitate reversing direction. First, you’ll want to place the gun on a padded workbench with the ejection port facing up, the barrel pointing to your left and the trigger guard/grip opposite you/facing away. 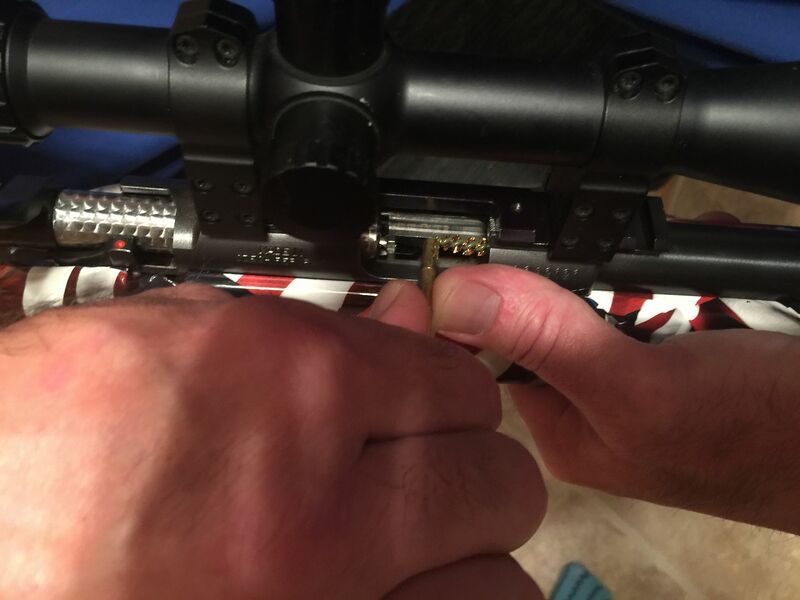 Next, open and lock the bolt back for semi autos. 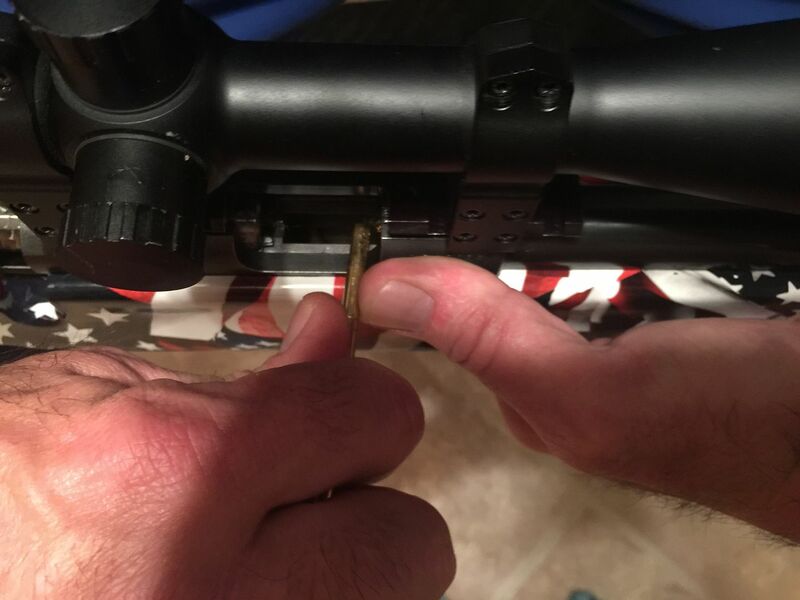 For bolt actions, it’s easier and provides more room if you simply remove the bolt. 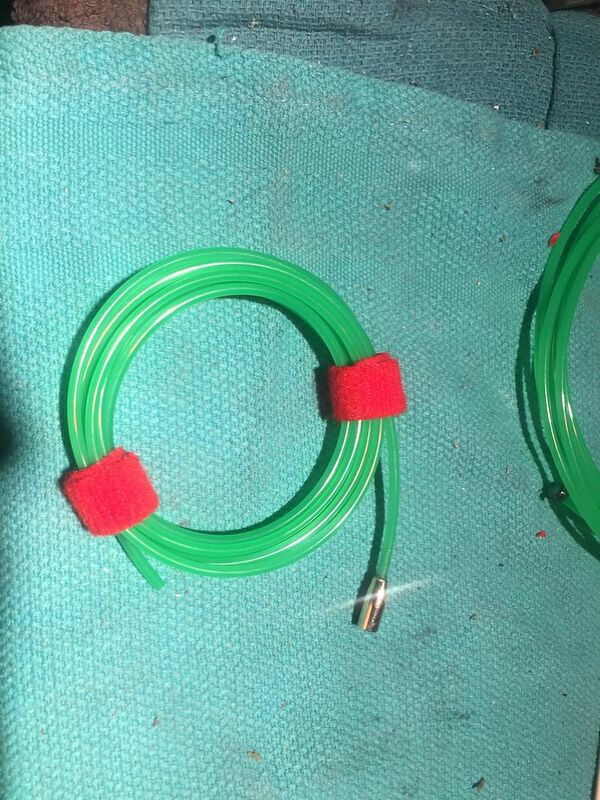 BEFORE YOU START THE CHAMBER SCRUBBING PROCESS, CLEAN THE MAJORITY OF THE SCHMUTZ OUT OF THE BARREL USING SEVERAL WET PATCHES AND THE JAGSNAKE FOLLOWED BY A SERIES OF WET/DRY CYCLES USING A LOOSE (.205”) AND TIGHT (.210) BUTTON PULLER. You basically want to get the barrel as clean as you can using the softer, less abrasive components of my cleaning system before scrubbing the chamber- the same goes for brush cleaning the entire bore with my brush pullers. If you limit yourself to the jag loop puller and Eezox, you can minimize the amount of desirable seasoning you remove from the bore. This system is designed to provide an atraumatic cleaning process to minimize the wear and tear on the rifling. Precleaning serves to significantly reduce the amount of carbon and silicates present before the brush is ever used, thus cutting down on the abrasive action created while cleaning your guns. Also- I sometimes use a .25cal brush for stubborn carbon rings. IMO, This concept is a common sense adaptation that is easily universally applied to cleaning all firearms. 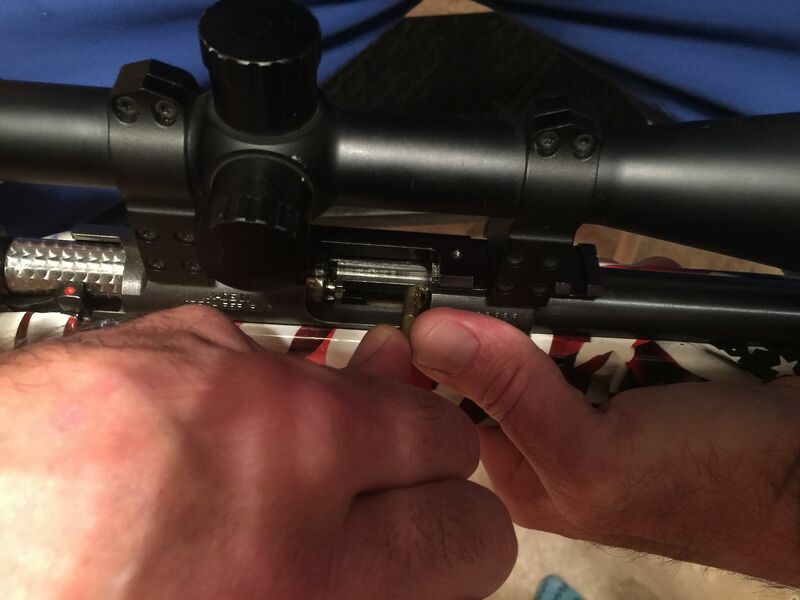 The first thing you’ll want to do is find a comfortable grip with your LEFT hand which places the tip of your left thumb over the front portion of the ejection port. The mechanics of the technique I’m outlining here is the same for all pistols, 10-22 rifles and bolt guns. You’ll want your chamber brush pre-bent to allow you to scrub the entire chamber including the leade, without getting too far into the rifling. Your main goal is the carbon ring that forms at the end of the cartridge casing. 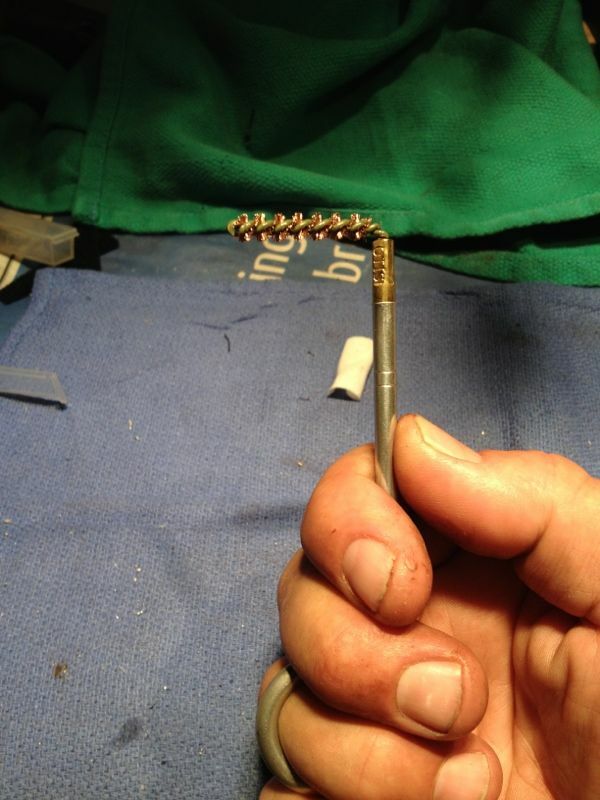 Bend your brush to allow insertion of enough bristles to clean the length of a casing plus about 1/4-3/8”. Some guns are inherently designed with a breech face and chamber opening that is recessed deeper than the front end of the ejection port. In these cases, it is often necessary to use a 45 degree angle in the bend of the brush. In guns that have a breech that is even with the chamber opening, a 90 degree bend in an Otis pistol brush provides the perfect depth to suit our purpose without getting too deep into the runout and rifling grooves. Scrubbing from here is simple and easy. Apply a liberal amount of the cleaner/lubricant of your choice to the brush. I will usually start with my standard mix of 1:3 Kroil: Hoppes #9. 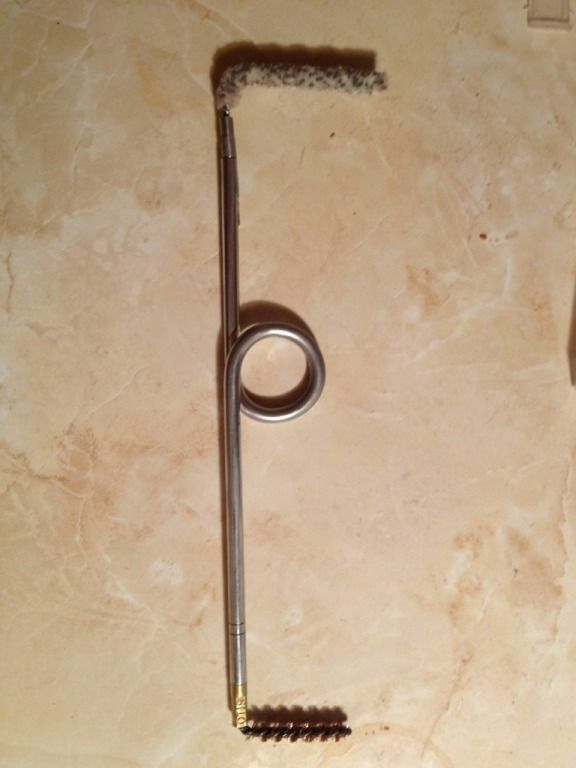 Place your ring finger through the finger loop on the chamber handle and grip the shaft of the handle firmly. Insert the brush into the chamber opening fully and push to full depth, then using your left thumb as a backstop immediately reverse direction. Repeat as necessary, applying additional solvent frequently. Then pull one wet patch on a Jagsnake, followed by 2-3 wet patches on a loose (.205”) button. Follow with dry patches. Repeat chamber scrub if necessary. Finish with tight (.210) button puller. If I’m storing for any length of time, I’ll pull a wet patch with the jag puller to lay down a coat of lube and protect against rust. Last edited by DrGunner; 08-12-2018 at 10:35 AM. Great tools and an excellent tutorial on how to use them. Those that are a good snug fit and provide a veritable squeegee action that clears build up from the lands and grooves measure .19”to 21”. Remember that .21” is close to pull-off size. (nothing but a brush will suffice for a true deep clean, but I've found that a .20' button puller will do a pretty darn good job) All bores have differences in diameter, smoothness, depth of rifling grooves and choke towards the muzzle. That’s why its important to at least finish the button sizing yourself, and you may find that different rifles of the same caliber need slightly different size buttons. I recommend that you make the very first button puller .17” or 18” to give yourself an idea of how much resistance there will be using the patches that I sent with the kit. You should test fit the button by feeding backwards- BUTTON FIRST into the breech face BEFORE you try to pull it through. As a rule of thumb, it should feed freely through the chamber and pass the leade and enter the rifling with very slight resistance. 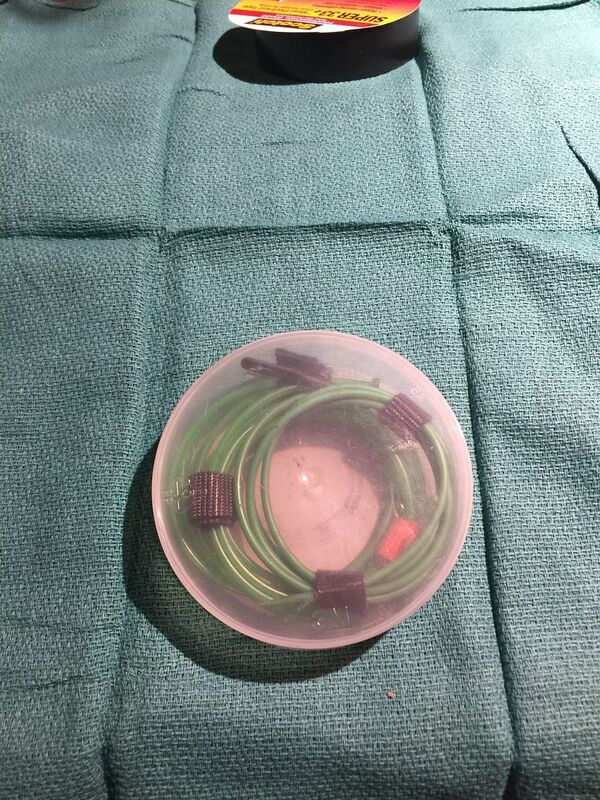 Once you get there, pull it through WITHOUT a patch. When you’re satisfied that it won’t get stuck, put on a small patch and pull it through DRY. If you ever pull a button off, no worries- just push it back out with a cleaning rod, and melt a new button on the end using a 40W Weller soldering iron- replace the tip with a 7/16” or 1/2” hex bolt with threads close to the diameter of the soldering tip. Make it oversized- .22-.24”, Dremel it down with a sanding drum and fine tune size with an emery board. I usually polish the button some after it’s sized, using a metal file, which will also remove any abrasive material left behind by the sizing process. You decide what to do with the other six button pullers. I usually maintain two for each rifle, most use a .18' to pre clean and the other a .20” to finish the job. Feel free to hit me up for help if you need it. So, in my original post I used Hoppes brass or aluminum rods, purchased on Amazon usually for around $9 or $10 with free shipping. They included a jag and jag loop tool and I was able to make three chamber handles from one kit, plus the drilling was easier because one and always came pre-tapped for the 8-32 thread for the tools, the other end being pre-drilled to receive the small brass stub which was easily tapped out to the larger size. The price of the Hoppes rods has gone up, which made me look around for a better source material. I was able to find rod stock on Amazon that comes in .25” outer diameter and 13 inch lengths, a full 2 inches longer than the 11 inch sections I was using from the Hoppes rod kits. There’s more work involved as I have to drill and tap both ends, but drilling and tapping 8–32 holes in .25” rod stock is much easier as there’s more room to adjust centering the hole as I drill, it’s simply more forgiving to errors. The end result Is a stouter tool with a full 1 inch longer reach on both ends. I was able to purchase the rod stock in a package of three for $9, free shipping but if I buy them in bulk it will come out to around $2 per tool. 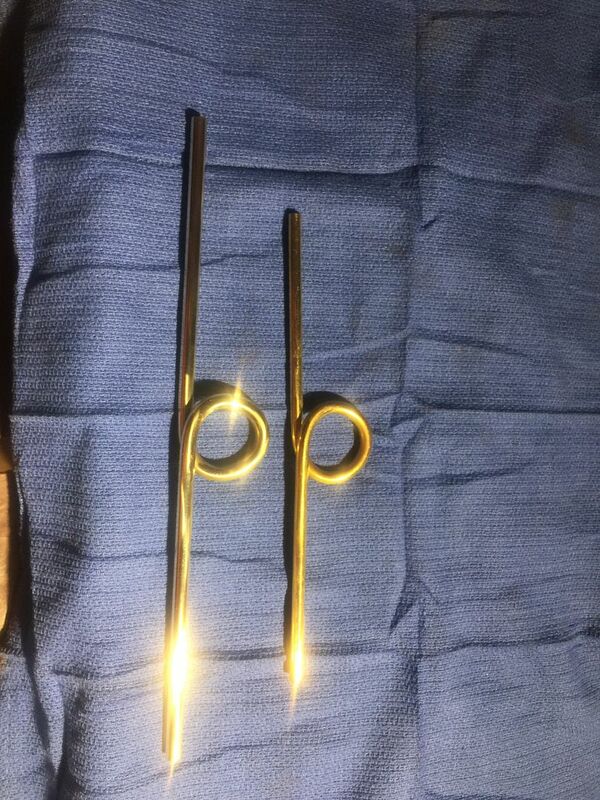 Here’s a pic of the original chamber tool next to the new “prototype”. I’m going to send the three out that I fabricated to a few of you who are avid shooter’s and will give them a good workout to decide whether the longer reach is a good thing or not in your hands to decide if this change will be permanent on all the tools I make moving forward. Let me know what y’all think. Looks like a nice change. I'm on my way to Amazon to run down some oof the brass stock to give it a try. I’m always thinking of ways to improve on these cleaning tools. One of the shortcomings I have frequently encountered has to do with the patch poking point on the button style patch pullers. I have the material and button making process down to a science. Having used them for years, I am quite happy with what I have created, but I’ve always had a little bit of difficulty with the pointy end of the pullers – they often bend when trying to poke through a patch which can be annoying. I often start the hole with an awl or scribe tool. Over the years I have tried many different methods and materials to harden the point on the patch puller tools, without success- until now. I had tried heat, crazy glue, epoxy and other adhesives without luck until last week. 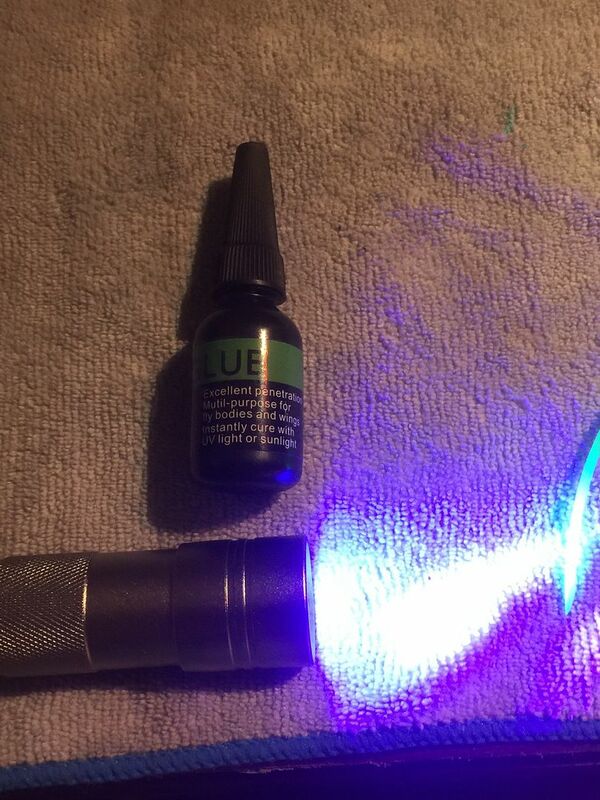 I happened upon a liquid adhesive that is used for tying fishing flies that is activated with UV light. 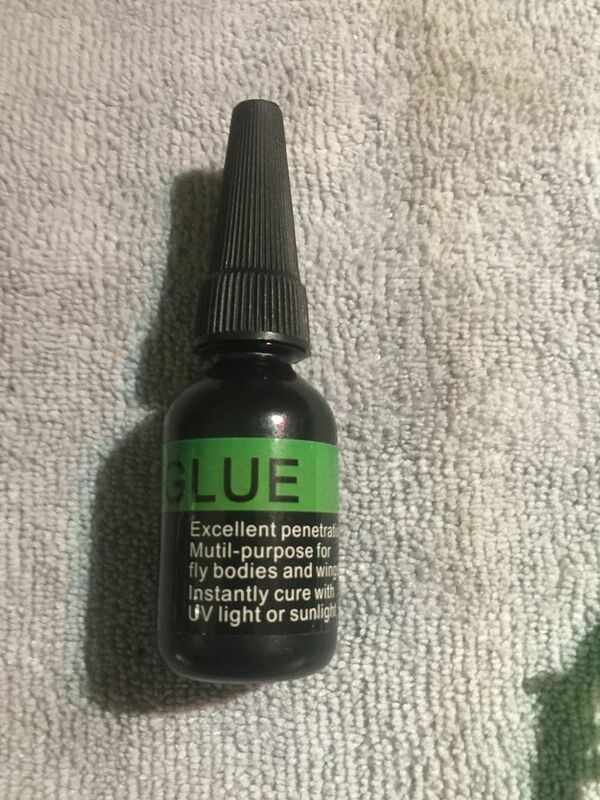 I purchased some of this glue on Amazon and I am extremely pleased with the results. You simply fabricate the button puller and point as per my original instructions, grinding/sanding to a conical point, then smooth and polish it by pulling the point through fine steel wool multiple times with strong pressure applied. 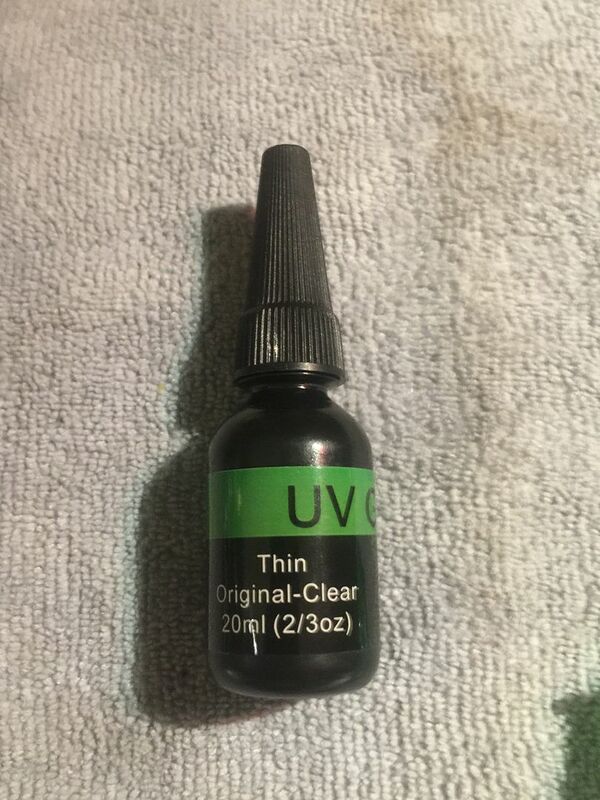 Now, to finish and harden the point, you simply dip it into a bottle of the thin UV Adhesive, scrape off the excess on the rim of the bottle, then holding the trimmer line vertical with the point down, flick it sharply a couple of times with your middle finger and thumb, which serves to remove excess adhesive- leaving an even coat. 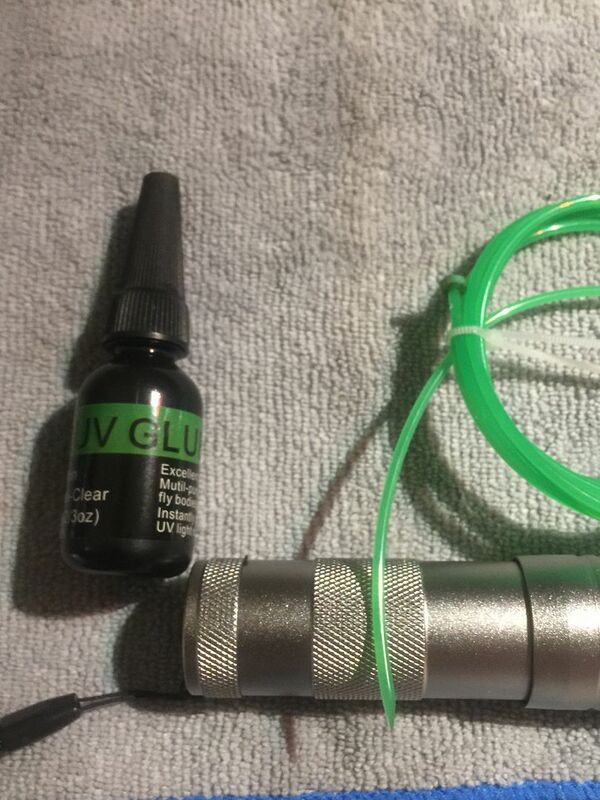 Then you simply cure the adhesive with a UV flashlight which comes with the glue kit linked below. 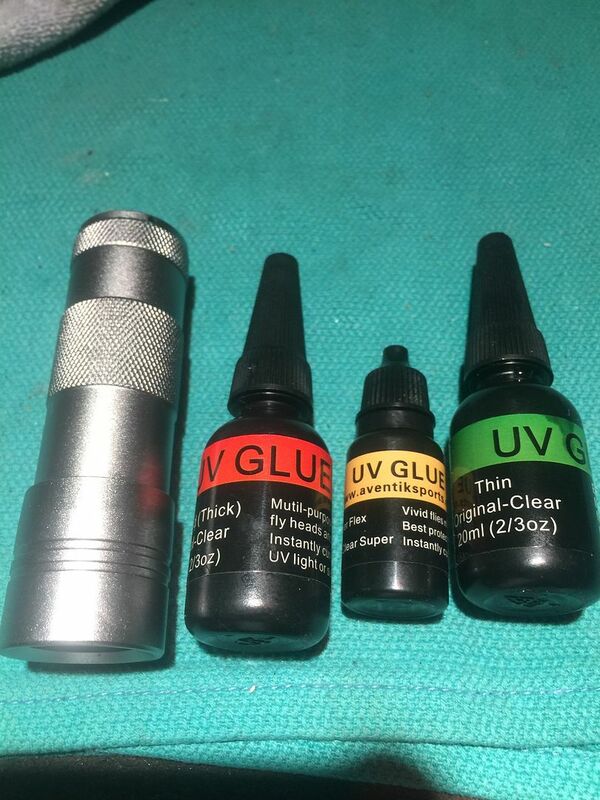 The UV adhesive glue has multiple applications so the investment would not be simply for finishing patch pullers- although it does happen to do an amazing job creating and incredibly hard and resilient point for the button pullers. The glue kit with flashlight cost me $22. I probably used about 10% of the “Thin” glue to dress the points on 50 patch pullers. This glue kit will go a long way, and has countless applications for repairing things in my shop and around the house. It literally sets hard in 10 seconds of UV light exposure. In trying to find a solution for a member having difficulty fitting a brush puller through the ejection port of a Buckmark pistol, I fabricated another female threaded jag/brush puller. This is an older design that I tend to use for bolt actions only, as the threaded ferrule pictured below adds length to the tool, with the brush threads adding more. When I fabricate my brushsnake, I cut off about 1/3 of the threads on an Otis pistol brush, drill out the center for the trimmer line, then shape, polish and affix trimmer line. That design is able to fit in my 10-22 clones, and (just barely) fits in my semi auto pistols. I’ve tested it on a S&W 622, Ruger SR22, Sig Trailside, Buckmark Contour URX, and Ruger MK III. I made a kit for a member who has a Buckmark that my brush will not fit- his manual says he should NOT disassemble his pistol for cleaning. (Mine has no such warning, but mine has a Weaver rail that runs the length of the pistol, providing a structural bridge that attaches the barrel firmly to the grip frame via a post at the rear of the frame- that same post prevents me from cleaning mine with a rod and brush through the breech- I would have to remove the barrel from the frame for that... which I don’t recommend. As I said- I have made these before, but I decided against making it a permanent part of the kit because I specifically made my brush pullers to be as short as possible to allow me to clean semi auto rifles and pistols without disassembly. That said, once the brush is worn out, that tool is basically useless. 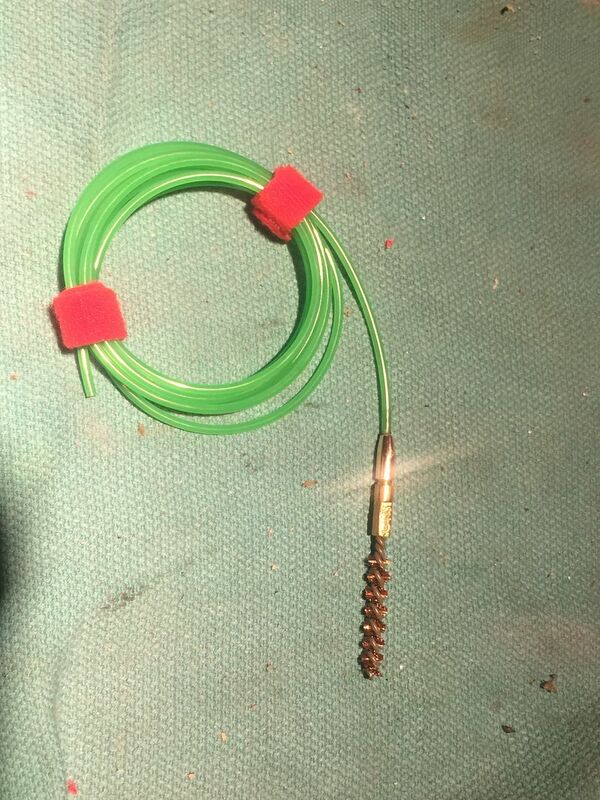 This device would allow you to swap between jag & brushes, but may not fit in the tighter spaces, non-semi auto firearms. In those firearms that the “modular”- replaceable design WOULD fit, so likely would a rod and brush which is my preferred method of cleaning. Of all of the components that I make, these also happen to be the most labor-intensive but also the least expensive. Here are pics of the finished product. Creating it is simply a matter of cutting a 1” blank from brass rod stock, drilling and tapping one end to 8-32, drilling the other end for the trimmer line, then shorten, shape, and taper grind it, polish it & affix trimmer line. Instructions on how to do each of the steps listed above has already been covered in detail throughout this thread, mostly on the first 3-4 pages of posts. 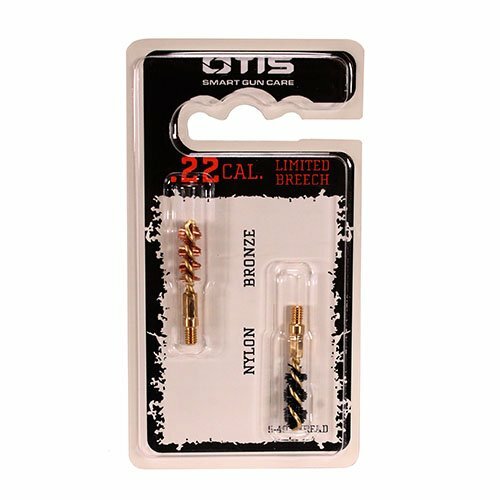 Otis makes 1" long bore brushes for .22 that might make things a bit easier. They are threaded 5-40, though. I will dig around and post back if I find a suitable replacement that works. DrGunner, have you had any luck finding replacement brushes? Yes and no. Otis still makes the same brushes I’ve always used, in nylon and bronze bristles in the handy 10-packs with the nifty individual hinged plastic cases... the trick is finding them in stock and at the right price. Amazon often has them for less than $10 per 10 pack, free shipping but they sell out fast. Optics planet is the most frequent supplier there. I know, an extra $5 isn’t all that much, but add shipping and it gets costly.... I’ve fabricated and shipped out well over 100 tool sets thus far, and it adds up. It’s much mo beda when I can grab up 50 @ $8.50 per 10 with free shipping. My trouble is, I can’t help but add new components to the set as they come into being based on the feedback and recommendations of the community. If you find a suitable alternative, please post up!!! 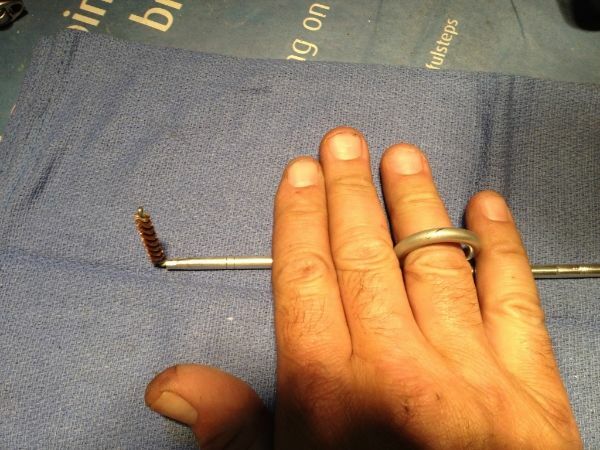 It turns out that those 5-40 threaded brushes are close enough to the threads that are used to connect the three sections of a Hoppes .22 rod together. 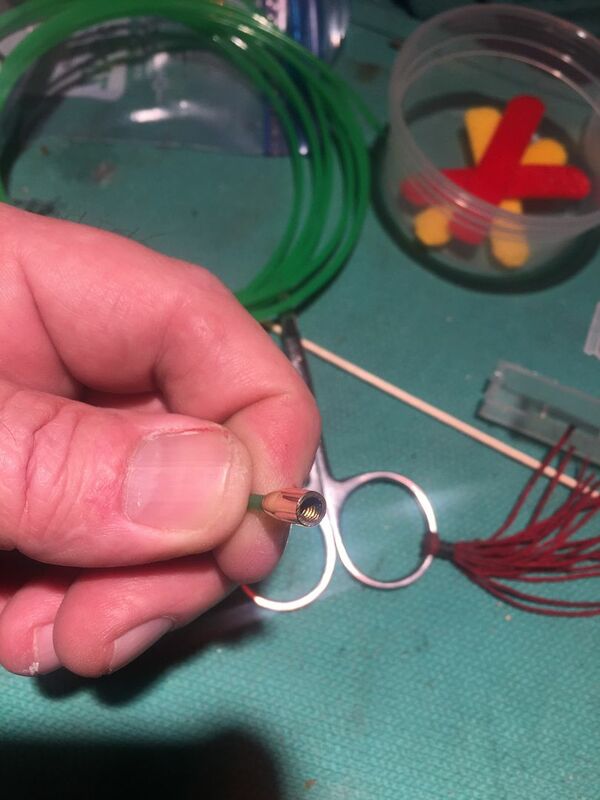 I simply cut a 1 inch section of rod from the end that has the female threads to connect the sections together and drilled it for trimmer line, then turned it down to a small bullet shape brush receptacle. The 5-40 thread brush threads in clean & locks in tight. I will say this, though – I tried to make a .17 caliber brush puller for a member here, and gave up after three failed attempts. 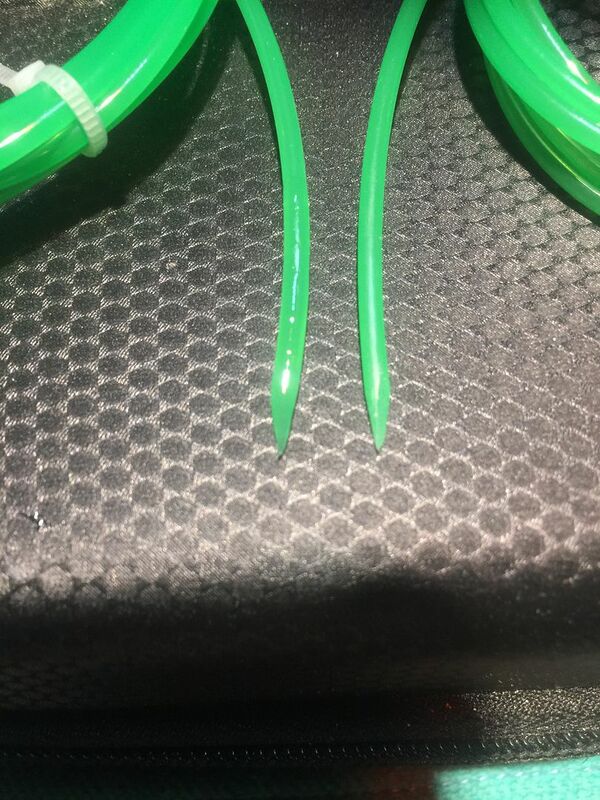 It’s simply too small to hold heavy enough gauge trimmer line directly into the brush stub. 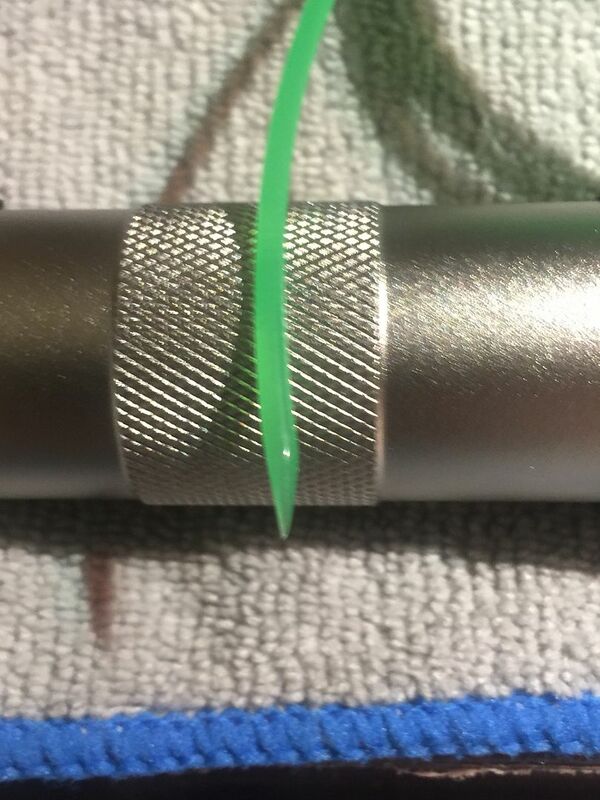 Cannibalizing Hoppes rods to create a female threaded collett puller may well be the answer to that conundrum. Those Hoppes rod kits are rather inexpensive at $9 for a kit that contains the three piece rod, a plastic loop jag type puller and a push jag. I used to use them for the blank material to fabricate my finger-loop style bore brush handles, but recently found that I can buy three .25’ solid brass rod in 14 inch sections for around the same price, and handles fabricated of the longer, heavier gauge rod stock are much firmer and easier to control without flexing when using the short brushstrokes needed to clean a chamber without scrubbing into the leade. Many shooters like to comfort themselves by saying that it’s impossible to create wear and tear on a steel barrel using bronze or even nylon brushes, but the truth is rimfire ammunition still contains silicates in the primer material which amounts to sand and glass shards in the propellant mixture, albeit in minute amounts. I truly believe that more damage has been done to rimfire barrels by their owners using improper cleaning techniques than anything else. This is a big part of the reason why I designed these tools to work as a system. I start by removing the majority of the grit and carbon by pulling wet patches on a jag puller which also serves to lay down solvent and begin breaking up the baked in goodness. 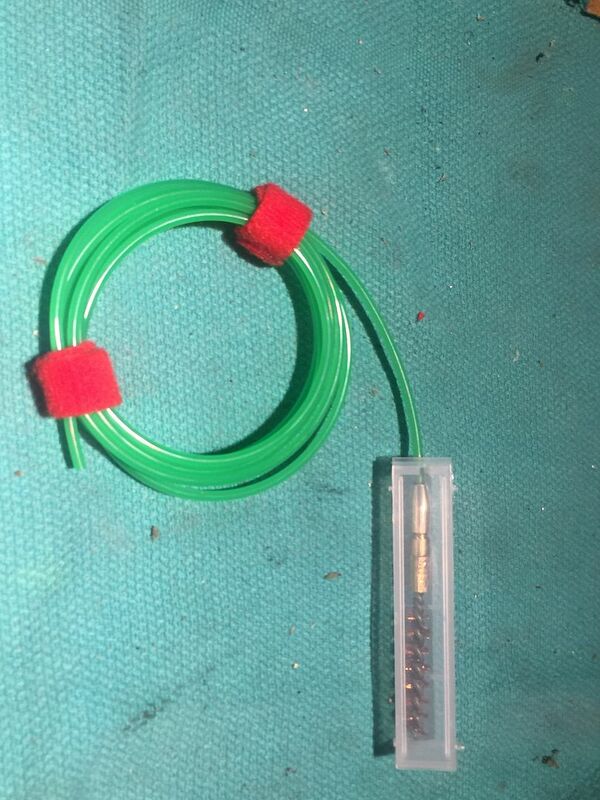 Follow that up with the chamber scrub, bore scrub (less frequently) only if necessary when accuracy degrades, followed by wet patches on a loose (.18”) button puller, then wet followed by dry patches on a tight (.20-.21”) patch puller. 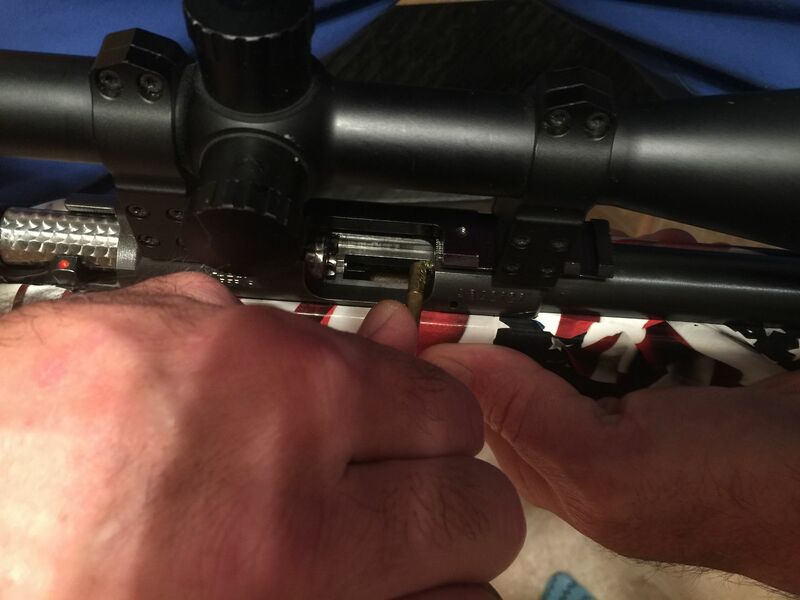 If the rifle is being put back in the safe, I will usually pull one final wet patch with Eezox to lay down a layer of protection/rust prevention. It is vitally important to always remember to pull a dry patch through the bore before shooting again, I once made the mistake of firing a rifle that still had oil in the barrel and ended up creating a hydraulic pressure bulge 6 inches from the chamber. I know how well these tools work because I own two borescopes and have used them frequently in the development of these tools and my cleaning process. Many rimfire rifles lose accuracy when cleaned and scrubbed through thoroughly. Proper use of these tools allows me to clean the chamber and bore adequately to maintain accuracy without removing too much of the beneficial lube/seasoning- which can be done several times in between deep cleaning sessions. I found this process out of necessity as it’s not uncommon for me to go through a brick of ammo during a serious range day. Speech to text isn’t necessarily my friend, I just realized how much I rambled on when you never even asked a question, merely made a polite suggestion which I’d like to thank you for in closing. Last edited by DrGunner; 03-20-2019 at 01:16 AM. Thanks for the links - very much appreciated. Looks like I'll be ordering from Otis direct, since 10 will last me a while. I'll be sure to post up any alternates if I find any.